The first thing you notice about the Giant Chixie is that it is an undeniably good-looking bike. ‘Cute’ and ‘cool’ would be the first words to spring to my mind, and never have I ridden a bike that’s garnered quite so many appreciative comments in such a short space of time. The combination of light blue and brushed aluminium is one pretty enough to please the more girly rider, yet hints at a tougher, sportier side that’ll please those looking for something a little more urban in feel. But it’s not all about the looks. 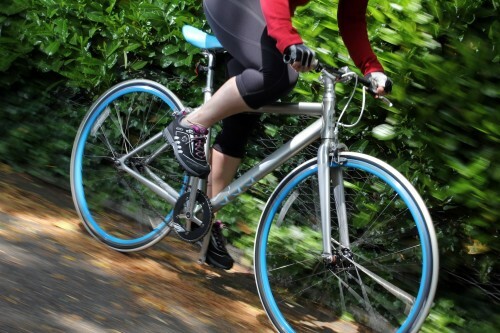 The Chixie is one of the first, if not THE first female specific single speed/fixed gear bike on the market. Conceived to appeal to women looking for a low maintenance, fun and attractive bike, Giant has put together a seductive looking package. Right from the word go there’s a bit of a ‘three bikes on one’ situation going on. 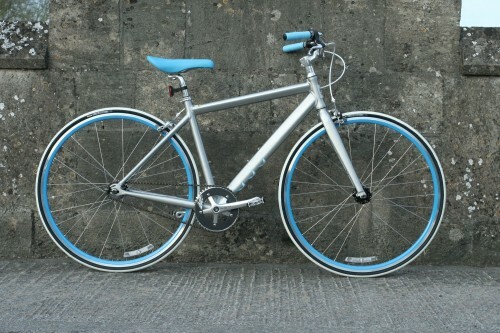 Bike one is a laid back café cruiser style, complete with high rise bars and the cool looks. This element of the Chixie’s character requires flat roads or cycle ways, and a large dose of cool. The handling of the bike suffers for the café bars, which cause it to be twitchy, with a pronounced wobble at anything other than full tilt, so complex manoeuvres are not recommended with the high rise bars on. Bike two requires replacing the bars with a flat bar, thus making the steering more surefooted, although still a little over lively due to the very upright nature of the fork. The result is a much sportier feeling ride that’ll appeal to urban riders. The cornering abilities of the Chixie are brilliant, and with the flat bar there’s a lot of fun to be had from riding the bike hard. Bike three is the ‘Fixie’ side of the Chixie’s personality. Flip the flip flop hub over and you’ve a fixed gear bike. With a flat bar it’s a great commuter bike, whereas fixed and with the café bars it’s ideal for pootling about town on cycle paths. On the flat the Chixie is a fun and versatile bike, especially if you stick on a flat bar. Surprisingly, the bike still looks just as good with a flat bar, giving it a sportier and more edgy look (check it out in the pic below). Sadly, outside of an urban environment, the Chixie does not lend itself to being a versatile, do it all, women’s single speed. The frame is too flexible to enable effective hillclimbing, and the tracking is inefficient, even with the original bars ditched for a more climb friendly flat bar. On descents, even with the flat bar there’s still too much ‘wobble’ in the steering to easily allow signaling, making it stressful for commuting when gradients are involved - the track bike geometry of many urban fixed bikes is always going to problematic in that respect so the Chixie is not alone there. On the other hand it does corner well on descents. The build quality and componentry are fine, with a mixture of own brand elements and branded bits and pieces. The saddle isn’t the most comfortable in the world, but it’s not bad, while the hand grips are very comfortable but aren’t particularly durable. The brakes work well, with a machined braking surface on the blue painted rim. The drivetrain is responsive, as you’d expect from a single speed, and durable. The flip flop hub is simple enough to change over if fixed is desired. One of the slightly disappointing elements of the Chixie is that its looks probably won’t last. Once the rims have become slightly worn, and the saddle and grips have got tatty and grubby, it’s going to be difficult to replace these features and keep the original colour scheme going. 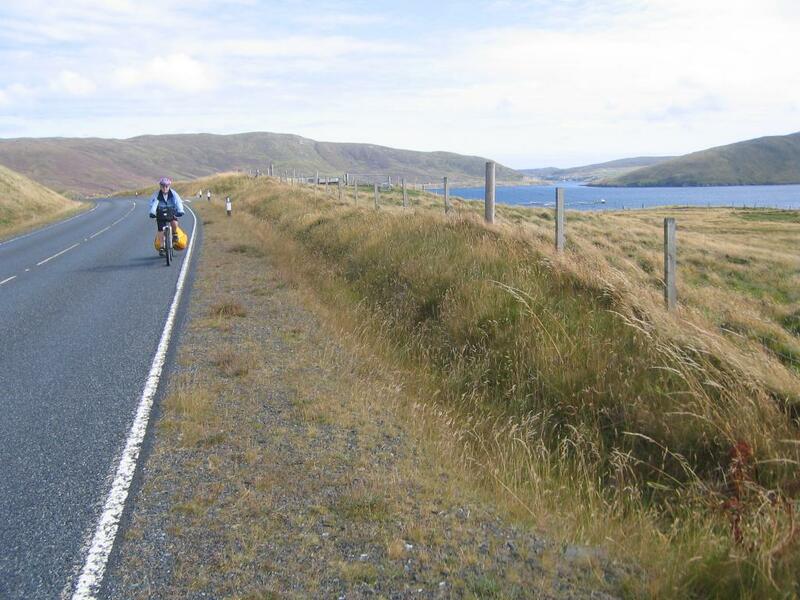 The brushed aluminium of the lower tube gathers road grime very quickly which sticks to the slightly roughened surface. An interesting attempt at a female specific single speed/fixed gear bike. Looks really great and nicely proportioned. Cafe bars limit it to flat terrain and urban use, as does level of flex in the frame when climbing. Even with flat bar the flex limits the versatility of what could be a really excellent fun all rounder. Drivetrain: 46T Sugino Messenger crankset and 18T flip flop hub. Build quality of frame and fork good, but light weight of frame tubing makes for a more flexible ride than is ideal if you want this bike as an all rounder rather than cafe cruiser or flat conditions commuter. Fork is sturdy and robust. Frame made from AluxX Aluminium- light weight (8.92kg for whole bike) of frame makes for too flexible a ride for climbing. Behaves well on flatter terrain. Fork made from AluxX Aluminium. Geometry nicely conceived for a comfortable but sporty ride. Good set up for averagely proportioned female riders. 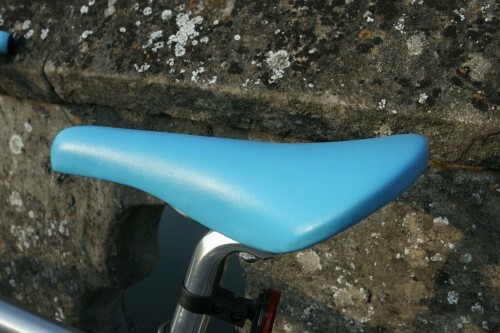 Reach was comfortable, even with flat bar instead of cafe bar as standard. Height of size S (45cm size) ideal for me at 5ft5". Taller women would probably find even the size M a little on the small side. 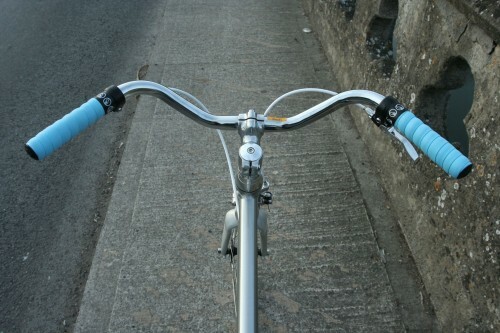 Comfortable to ride, with pleasant relaxed and unchallenging position. Eager ride, but with too much flex and slightly too twitchy for hill climbing. Best suited to flatter conditions and urban riding. Power transfer was immensely efficient. How would you describe the steering? Was it lively, neutral or unresponsive? Steering with original bars was slightly ungainly, especially when climbing. With flat bar, still somewhat twitchy. Corners very well and nicely balanced. Climbing not ideal, especially with original bars. Better with flat bar. Nice laid back position for flat road riding. Would you consider buying the bike? Without a shadow of a doubt if I lived in a flatter, more urban environment. Doesn't the lack of mudguards or carrier rack rather limit the usefulness of this bike as a commuter? Can't deny it looks lovely, and looks fun but as soon as I found myself seriously considering taking one out for a test ride that immediately put me off. They're really scraping the bottom of the gimmick barrel with this one. I forgot to mention, there are eyelets for mudguards front and rear.